The Resplendent Quetzal is omnivorous. Their favorite foods are fruits that are associated with the avocado family (see picture at right). They will also dine on insects and small vertebrates such as lizards and frogs. 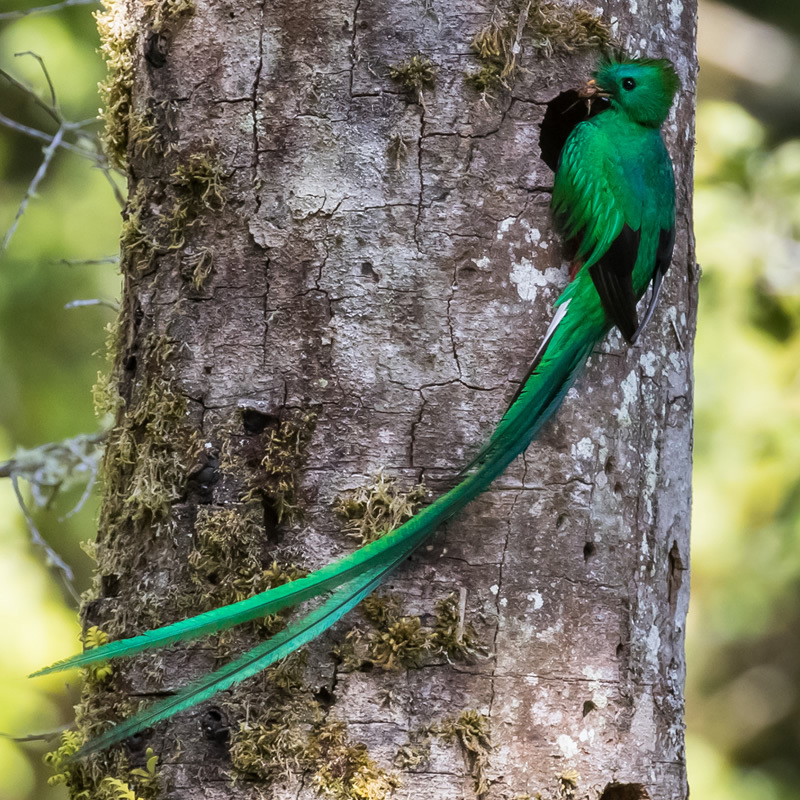 Resplendent Quetzals live in the cloud forests of Central America. Cloud forests are defined as tropical or subtropical forests, often located in higher altitudes, that have a large amount of cloud cover or low, settling fog. The Resplendent Quetzal is roughly 14 - 16 inches in length. Its long train of tail feathers adds an additional 24 - 25 inches. The Quetzal is a beautiful bird characterized by the aquamarine feathers on its head and body. In stark contrast to these feathers is the bright red plumage that is found on its breast. The male is more colorful than the female so that it will be able to attract the attention of the females. Females are less colorful and do not have a long train of tail feathers. This helps the female to be less conspicuous and hide from predators. On the Resplendent Quetzal's head is a small crest of spiked yellow and green feathers. The eyes are black, and the beaks of males are yellow, while the beaks of females are black. Resplendent Quetzals will usually carve out a nest in a rotten tree, using their beaks to cut out the rotten wood. Here, the female will lay two or three eggs in a given clutch. Both male and female will share responsibility in building the nest as well as incubating the eggs. The incubation period lasts two - three weeks. The main threat to the Resplendent Quetzal is degradation of its habitat by human activity. These activities include farming and capturing the bird for commercial practices.